This is the 2nd concert, celebrating the 69th independence day on its eve to promote Korean culture. 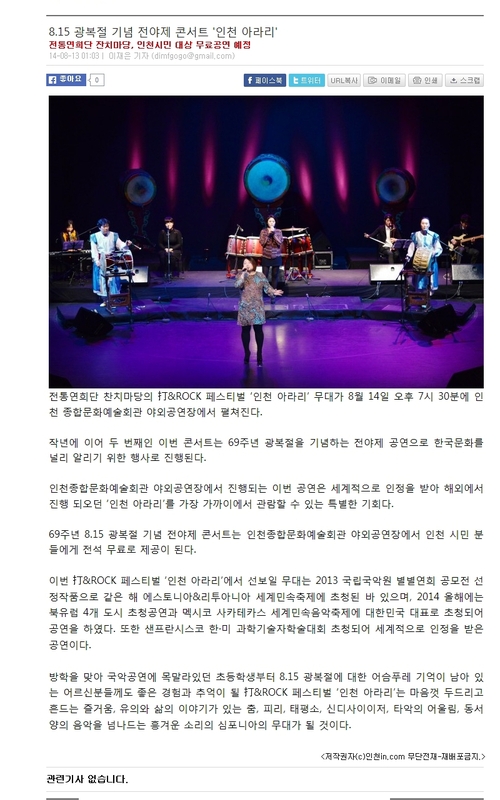 The concert must be a special opportunity to enjoy 'Incheon Arari' at foot for free, that has been recognized worldwide. What will perform at 'Incheon Arari' concert was a selected piece at 2013 National Gugak Center ByeolByeol Yeonhui contest and was invited to perform at Estonia & Lithuania the same year, and was invited to the tour concerts in 4 Northen Europian cities and at Mexico Zacatecas International Folk Music Festival (CIOFF), representing Korea this year. It also has been invited to UKC in San Francisco to be recognized worldwide.